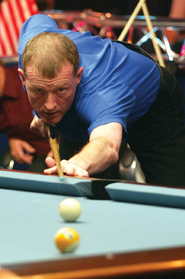 WITH INTERNATIONAL bragging rights at stake, the Mosconi Cup produces a unique layer of pressure for the European and American squads. No longer is pool an individual sport; now you're playing for team and country (or continent). Before the first break at the 2002 Mosconi Cup, Team Europe was a huge underdog. The Americans had captured the last six transatlantic competitions. Not only that, they had completely embarrassed the Europeans the year before, taking the 2001 Cup by a 12-1 count. So as Steve Davis prepped for his match against Earl Strickland, knowing his team led 11-9 and was one win away from victory, Team Europe knew nothing was over until that last 9 dropped. Davis ended a 7-year wait for Team Europe. Davis and Strickland traded racks early in the race-to-5 in front of a raucous crown in London's York Hall - 1-1, 2-2 and 3-3. Then Davis got on the hill first, with an icy break-and-run. Strickland, who was battling through kidney stones that required surgery just weeks after the competition, answered with his own runout. One rack - Davis wins, the Mosconi Cup goes to Europe; Strickland wins, the Americans are still alive. After a pushout and Strickland safety, Davis scratched on a table-length kick. With ball in hand, Strickland worked through the low balls, but let the cue ball drift getting on the 6. His tough cut rattled in the jaws of the corner pocket. Davis ran to the 9 and lined up a near straight-in shot. The clincher hit the back of the pocket, and York Hall exploded - confetti, team hugs and plenty of high fives. Meanwhile, Davis sat to the side shaking his head in relief, offering an ominous appraisal of the pressure only experienced at the Mosconi Cup. "Every shot is like blood," he said.